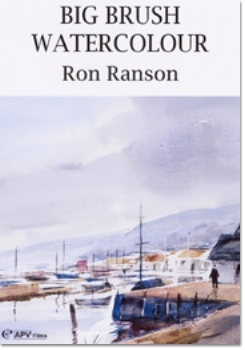 Ron Ranson’s instructional video Big Brush Watercolour, which has just come on to the market, is a complement to his recently published book of the same name. It is designed to be used in conjunction with the book, though it can also be viewed with advantage on its own. 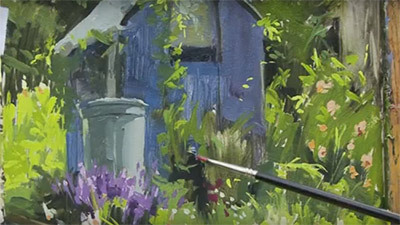 This video, which lasts some 60 minutes, is mainly concerned with developing watercolours in the comfort and convenience of the studio, many from photographic material. The techniques described and demonstrated follow the pattern of Ron's previous video and we are again shown his deft handling of the hake (a flat 1¾" goat hair brush), the 1" flat and the rigger, and all his work is carried out with these three versatile implements. The main masses are put in with the hake while the 1" flat is used for objects requiring greater accuracy, for its chisel edge is ideal for painting the rectangular shapes of buildings and the linear forms of masts, poles, fence posts and the like. The rigger is reserved for finer effects - twigs, grasses and objects which need a more detailed treatment, such as the human figure. 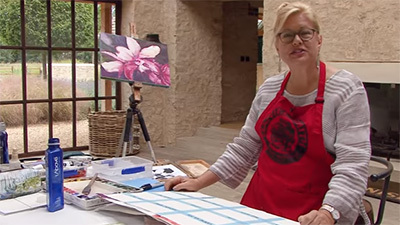 All the demonstration paintings are done on unstretched 140lb Bockingford in spiral pad form and this popular and inexpensive paper responds well to the bold and direct method of applying paint. The inexperienced should perhaps be warned that it is less receptive to the more laboured approach and does not take kindly to attempts at alteration. 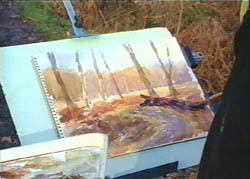 Like all experienced teachers, Ron Ranson is an advocate of the limited palette and his seven colours are raw sienna, burnt umber, ultramarine, alizarin crimson, light red, lemon yellow and Payne's grey. He shows us first how he tackles skies and, with the hake, demonstrates cirrus, cumulus and nimbus cloud effects. 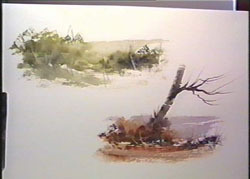 For these he applies an overall wash of raw sienna and uses a mixture of Payne's grey and alizarin crimson for cloud shadows. 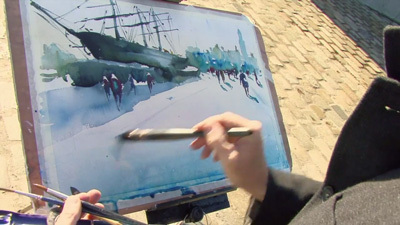 Throughout he emphasises the need to paint boldly and freely and at all costs to avoid fiddling. 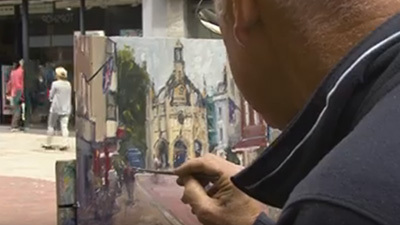 He demonstrates his method of tackling foregrounds, applying paint firmly and directly and using knuckles and finger nails as well as brushes in the process. He goes on to show us how he paints trees: distant banks of foliage are put in simply and softly with washes containing blue, to suggest recession, while the rigger is pressed into service to portray the tracery of the twigs and branches of nearer tree forms. 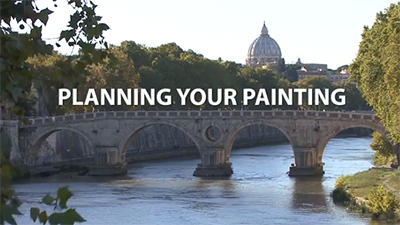 There follow seven rapid demonstration paintings, some based on photographs, of subjects which include a snow scene, an autumnal woodland, a Scottish loch, a river, a weir, a Greek villa and a French street scene. Several of these paintings are preceded by monochrome studies - a useful preliminary where tonal values need careful consideration. 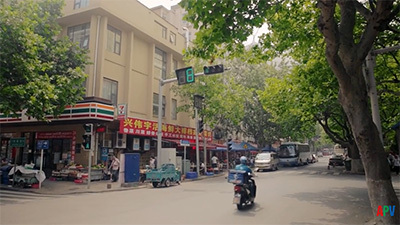 Sound and vision in this video are both good and the production is of a professional standard. 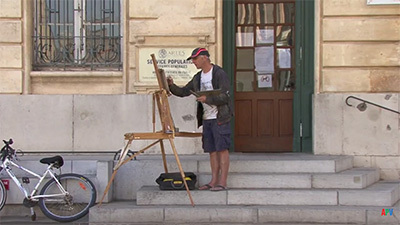 It can be recommended with confidence, particularly to those who have not seen the Ranson technique at work.